BYOD & BYODx—How Are You Meeting High Expectations? The Bring Your Own Device (BYOD) phenomenon is almost single-handedly responsible for the moniker, “disruptive technologies.” The first iPad was released in 2010 and soon made its way into the classroom. Understanding, integrating, and standardizing on the iOS platform was disruptive, but somewhat defined. Those were the good old days of disruptive technologies. Most managers reported that their users wanted to use whatever manufacturer-supported wireless video solution was available on their particular device. “This in and of itself is a challenge, as we knew of three different, incompatible, means of doing the video,” said Anderson. 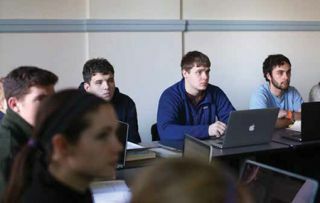 Until the close of the 2014/15 school year Gordon College located in Wenham, MA, has taken a measured and limited approach to BYOD support in classrooms. Chris Imming, CTS-I, CTS-D, director of media services, Classroom Design at Gordon College said, “This year we’re going to be deploying wireless collaboration devices such as the Mersive Solstice Pod, or the Kramer Via Series in select classrooms.” Noting that screen size is still a limiting factor for viewing at typical classroom distances, Imming is looking toward a screen sharing solution to be robust and provide some new opportunities in the classroom. “Our plan also includes deploying some of the new Sharp Aquos Board models and explore how screen sharing via Touch Display Link with bring your own devices will work in larger classroom spaces,” explained Imming. We all learn differently. We act differently, we respond differently and we communicate differently. Variety is very much the spice of life. But it can also cause roadblocks for the ways in which we absorb information. Some people can see something once and remember it, while others study it for days on end only to vaguely recall a small fraction of the information. While some of that is based on IQ levels, optimal memory retention is achieved by also maximizing one of three possible learning styles: Visual, Auditory, or Kinesthetic. In the educational market, engaging students through all three learning styles is the key to scholastic success. As such, it’s important to integrate classroom educational tools that can maximize the benefits for each learning style, leaving no student left out. • Visual learners tend to learn best through graphs, charts, pictures, and body language, as well as watching lectures. In order to maximize visual learning capabilities, educators must captivate using visual tools, as with Power Point presentations using freestanding or whiteboard-mounted displays. Tools like these are mutually beneficial for students and teachers, as they present students with the material in their most optimized cognitive learning style, while teachers are able to pre-arrange presentations to use for multiple classes and/ or lesson plans. • Auditory learners retain information based on verbal delivery. These are students who benefit from listening to lectures while recording them, and playing them back later as a study method. Repeating the information aloud as they learn it will also benefit these types of learners. AV equipment with recording devices can be a great learning tool, which teachers can either leave up to the students as a BYOD (Bring Your Own Device), or record their lectures and make them available online. Many projector mounts come with audio equipment to allow teachers to be heard clearly throughout large classrooms, thus allowing auditory learners to hear and record lesson plans without worrying about volume complications. • Kinesthetic learners are the hands-on learners group. They prefer demonstrations, both from their teachers as well as self-delivered demonstrations as a means to recap a lesson. Hands-on learners, such as these, benefit from demonstrative learning with the help of interactive displays, which can be mounted to existing whiteboards with the right mount. Demonstrating material they’re working through is not only a benefit for them, but also as a means to reiterate lessons to the Visual and Auditory learners in the classroom. As with any integration project, being aware of the goals of a classroom upgrade or design is the key to creating the best solution possible. Having high quality designs that are safe is especially important in any learning environment where students are at risk for injury due to faulty products. Check all project hardware and mounting materials for compliance with UL testing standards, which provide optimal safety assurance. Plan ahead, get the facts, and optimize your options. After all, this is the education market. Think smart.